Cockroaches are generally nocturnal insects. You’ll often notice them scuttling along walls and crevices as it starts to get dark. If you’re seeing cockroaches during the day it’s likely you have a significant infestation, as roaches will only venture out during the daylight hours if their nests are overcrowded. Cockroaches like three things – food, water and heat. If your home provides these three essentials you could be a candidate for invasion. The following tips will help make your home an unattractive target for this spiny-legged, hard-shelled enemy. Caulk, weatherstrip, and repair holes around water pipes, baseboards, doors and windows. This is important in apartments, where roaches can move from unit to unit along pipes. Put screens over windows, vents, floor drains and ducts. They can be roach highways and hideaways. The anti-cockroach arsenal contains a number of weapons you can use to fight a cockroach infestation. Sprays – Surface sprays will create a coating that repels roaches for 2-3 weeks. “Total release” sprays kill on contact but don’t linger – great for a quick knock-down when you can see what you’re fighting. Dusts and powders – Good for large infestations, these products generally work by damaging the cockroach’s carapace (it’s shell) and causing the insect to dehydrate to death. 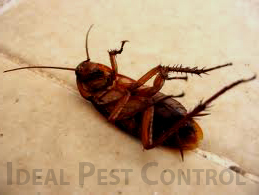 Baits – Excellent for smaller infestations, baits are pet and child safe and can be placed unobtrusively wherever cockroach traffic occurs. Traps and glue pads – Useful for placing beneath large appliances, these mats lure cockroaches then trap them on a layer of adhesive. Boric acid – Boric acid is an effective dusting agent for cockroach control. Often the main ingredient in baits, it can be bought at hardware stores and placed in wall cavities and other out of the way places to catch cockroach traffic. Homemade remedy – Mix equal parts baking soda and icing sugar and place on small squares of tin foil wherever cockroaches travel. if nothing works call professional pest control to illuminate from your home and business.